On some days in the field, I almost despair. It was a red-hot morning and we drove two hours to see a cattle feeding centre and destocking programme in Miyo, a village in southern Ethiopia. The more we drove the drier the landscape became until eventually it was totally barren, just dust and stones. As we arrived at our destination on the top of a hill there were panoramic views all around us. I was told that three years ago this area used to be a vibrant area for farmers and herders with crops and precious grassland on the hills all around me. Now there was nothing. We met our local guide, a young man from our partner, GPDI. He started by telling us about the animal feeding centre which SCIAF (Caritas Scotland) is supporting. It may seem strange to be feeding animals in a time of drought, but it is perfectly logical. If you don’t keep alive the animals that the people depend upon for their food and income, and they die, the people will become totally dependent on humanitarian aid, even if it does rain. If a family has livestock and the rains do come, then they will be able to recover and will become independent and self-sustaining again. There were maybe one hundred cattle from cows to calves and goats and sheep. At first it looked quite cute and hopeful as the animals chomped on grass in rickety troughs. Then I started talking to the people. The livestock programme is the equivalent of intensive care for the animals they have left. These cows and goats are the last things families have got between themselves and, basically, oblivion. One woman told me that if her cow had not received this food it would be dead and in fact it hadn’t been able to stand up it had been so weak. The more people I spoke to the more they all echoed the same message. Then we moved on to look at the ‘destocking’ programme. Destocking is essentially a euphemism for slaughtering cattle that are unlikely to survive. By thinning herds in this way, the remaining pastureland can be used to feed those animals more likely to survive. The owner receives a cash payment for the animal and the meat, if it is healthy, is given freely to the most vulnerable members of the community. She and others are bringing cattle too weak to survive. The households they come from, desperate for food, have no other alternative than to sacrifice their most prized asset before it collapses and dies by the side of the road for nothing. Make no mistake, the plight of the people here is desperate. What little cattle they have left will die soon, or they will choose to slaughter them first so they can at least get a little money for a few weeks. 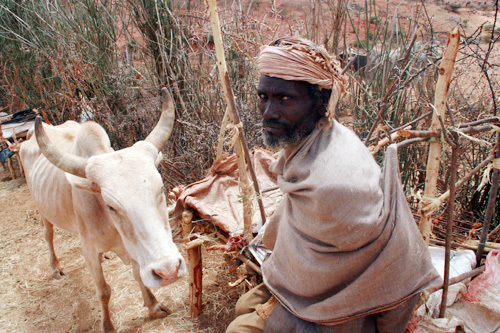 Either way, their lives, pastoralist culture and way of life is under imminent threat. But the problem is enormous and our work is only enabling a small amount of the total affected to gain a temporary respite to their hunger and desperation. “We are praying to God. I have never seen such a drought in all my life,” says the elderly Guo. For many of the people I met today I asked them what would happen if the rains now came. Each said that even if the rain came, they have already lost everything, it is too late. Their only option now they said would be to dig the earth with their hands and try to plant some basic food. However, it really doesn’t look like the September and October rains are coming.